The Qualified Inspector SHALL have significant installation experience. The Qualified Inspector SHALL also have significant knowledge and understanding of the operational requirements of the course ELEMENTS he/she inspects. The Qualified Inspector SHALL be familiar with a wide variety of course designs and operating systems beyond those used by his/her own company, have familiarity with the types of structures to be inspected, have a clear understanding of his/her own limitations, and consult other professionals when required. Each Qualified Inspector SHALL meet the criteria listed below and SHALL have Mastery of all the standards listed in the ANSI/ACCT 03-2016 Challenge Courses and Canopy/Zip Line Tours Standards, Chapter 1: Design, Performance and Inspection Standards Qualified Inspectors may also possess an ACCT Inspector Certification in good standing. Demonstrate skill, experience, and training to be considered a COMPETENT PERSON with regard to worker safety and fall protection. Have a demonstrated ability to inspect course ELEMENTS in accordance with ACCT Challenge Course Standards. 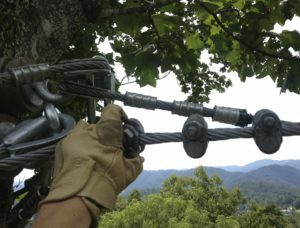 Demonstrate in-depth knowledge of a wide variety of challenge course and canopy/zip line tour designs, building techniques, equipment, materials, and systems. Demonstrate participation in ongoing professional development. Have a minimum of 150 documented course builder days. Have performed a minimum of 12 inspections under the supervision of a Qualified Inspector. These days assume a minimum number of inspections for each type of installation to be inspected, such as trees, poles, indoor, steel structures, and/or specialty builds. Have a full understanding of the various course ELEMENTS he/she inspects including the operational procedures. Demonstrate his/her ability to consult with course designers and other professionals.